Every week Cartoonist +Harold George features The Funnicks, a comic strip whose content revolves around ideas from news, people and funny situations that he encounters in his everyday life. You can find his other comic strip on The Web Comic Factory. Please visit The Funny Cartoon.com where you will see The Funnicks as well as other great and funny comics. Happy New Year to all of you! 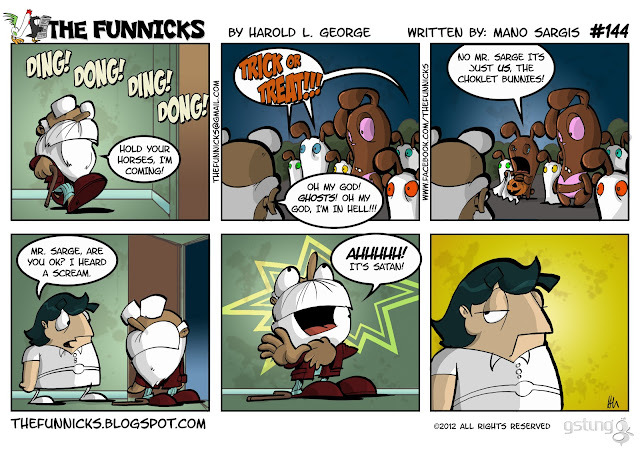 The Funnicks #144: Trick or Treat!